First off, what a beautiful city if you find the right corners! 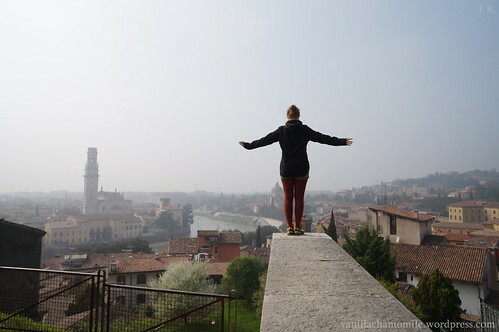 This is a view of Verona from a hillside park we stumbled upon by just climbing these promising narrow stairs near the river. Promising alley, greeted with a playful dance! It was beautiful in a very simple and fulfilling way to just walk around the park, sit on stones warmed by the sun and enjoy the views from all the different levels. Being situated on the hills surrounding the city, the park seemed to be many parks all in one, each level differing in plants, view, wildlife and people visiting. And stumble upon more beautiful and secluded places we did! 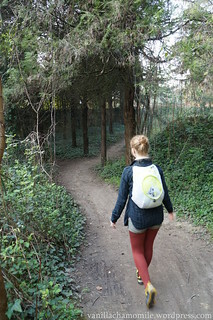 Rather than visit all the touristy places, we continued going where the map was green and where the hills looked sweet. This method ended up bringing some very rewarding experiences. 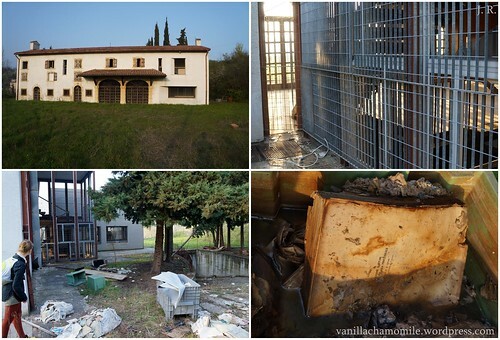 Although on this one trip, we ended up on an overgrown hillside plot with an abandoned house, the chain locking the door broken and old wet books scattered all around the house… very eerie, somewhat surreal, but so memorable. 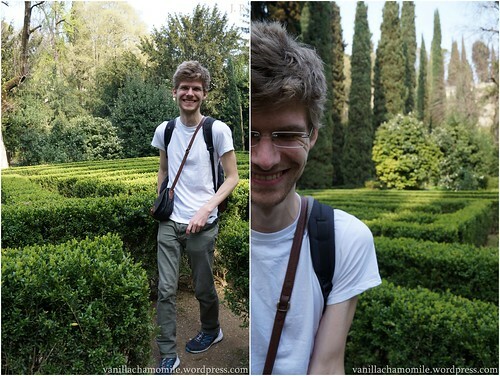 We came to love another Veronan park quite well: the giardino giusti. Situated in the middle of the city, but again on the side of a hill, it felt like a multi-level playground for miniature trail runners. 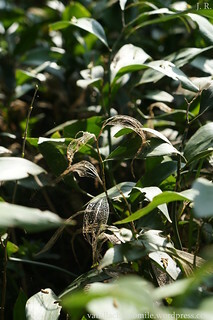 It offered a neat experience walking and exploring every corner of every level (it’s not very big), take photos of the plants and – once more – relax in the spring sun. There were also neat surprises like a hedge labyrinth (race to the center!! which Terry had to let me win because I couldn’t run from all the giggles…) and a pool with turtles. 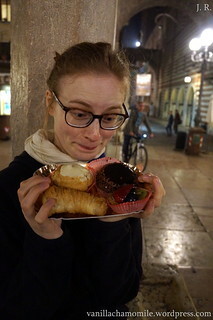 Interlude: As I am always very interested in the regular food of other places, of course we had to buy these mouth-watering Italian pastries from the neatest charming little bakery near the city centre of Verona on our late evening arrival exploration walk. I also think my thrilled hungry turtle face bears testimony to their deliciousness. Another favourite experience with a surreal component was following the old city wall we chanced upon during another walk initially aimed at finding another green spot. We walked beside it for quite a while, the greens growing wilder, views at the city alternating with narrower paths with walls and greens limiting sight to both sides; everything enveloped by a very mediterranean feel. 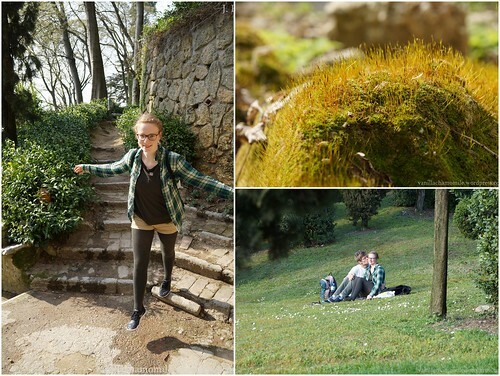 We rested on an extensive meadow to the side of the path with benches and open fire pits. During our stay, every five minutes – without fail! – the same thing would happen: a Veronese person would appear with their dog, sitting down on the same bench as the others before, talking in loud excited Italian on their cellphones. A favourite pastime of Italian dog walkers? 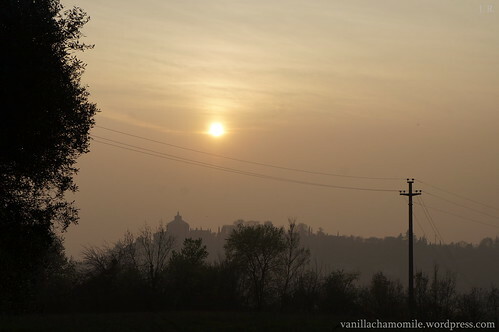 During the days in Verona, we also went on a one-day train trip to Venice. I had been there two times before when I was younger. Seeing the city again was a great experience! It is so beautiful, like straight from a video game (like Assassin’s Creed?) or a movie you might then blame for its being surrealistically beautiful. 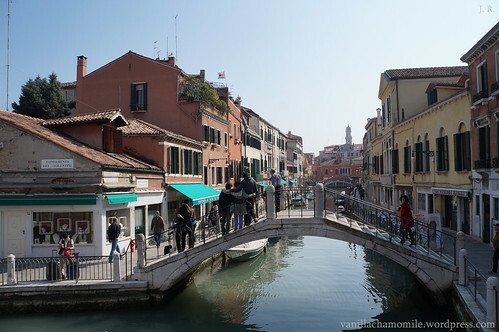 Of course, Venice was overrun by tourists even in March, but if you do not insist on going the main tourist sight routes, it is possible to walk around in peace and just get immersed in the wonderful atmosphere. 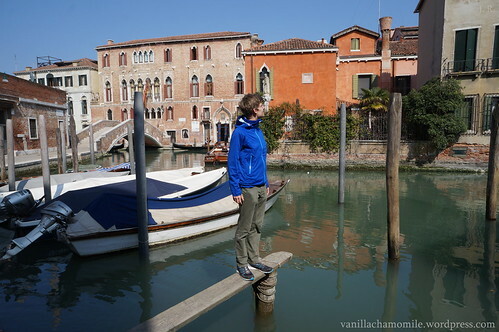 Most of the time, we were content to just wander the endless alleys like this, always coming upon a canal of a size ranging from tiny to huge after a few turns at most. The one attraction I insisted on seeing again was the cemetery Isola di San Michele – it is an ethereal place; a cemetery island built in the middle of all the water, only reachable by boat, surrounded by tall walls and containing dozens of different compartments crowded with old gravestones, angel statues, trees, and flowers. Unluckily, we took so long wandering the city that we only arrived at the island 30 minutes before closing time. I tried to cherish the short time there all the more, but I suppose I will have to go there again one day. The sun set over Venice way too fast. Worthy of one last comment is the Venetian public transportation for getting around within the city: semi-big boats with regular schedules like busses. Like something, I don’t know, a landlocked mermaid might wear? 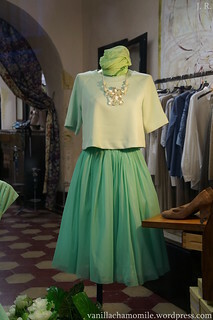 In total, what a fine stay in Verona and Venice (and what a lovely outfit I totally fell in love with displayed in a little Italian store, but it was expensive, so the photo and dreams were all of it I took home with me). In general, I am not too much one for city trips, but this was very rewarding. I suppose the moral is that if you are open enough to optimistically roam and keep an eye out for the special parts of a city full of the kind of personality you are looking for, you can get lucky like this! Up next: Part two with some awesome traily photos from one of the best trail running-y parts of Italy: the mountains around Limone sul Garda!! 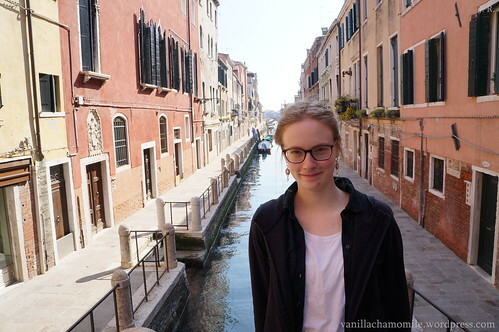 First off, it’s interesting the way the concept of your Italy trip had passed beyond the range of my retrievable thoughts some time during the year, and when I saw this post I was initially like, wtf, she was in Italy in March? However did I miss THAT? But then the concept slowly came back to me out of the depths of my consciousness and regained shape. Thanks for bringing it back to my attention again! The first pic that resounded with me is the one where you are peeking from behind the corner at the abandoned house – the caution and curiosity is very neatly captured in your pose and the entire setting. 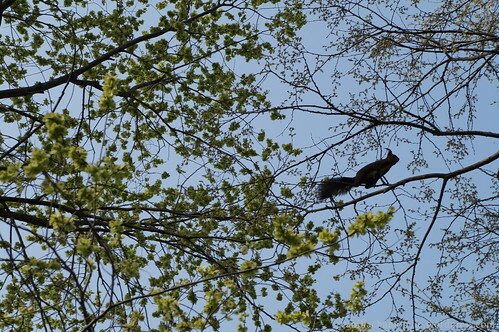 As if you were caught in the exact moment of saying shyly, someone there?, and thinking, I wanna explore. Thrilled hungry turtle indeed, hah! 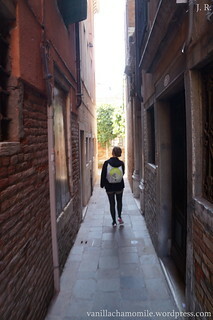 I’m also fond of the Roaming Venetian alleys photo – again, your body language is telling us an additional story here. The way you’re looking up gives me a clear indication of your curiosity while you’re walking down this charming narrow alley. 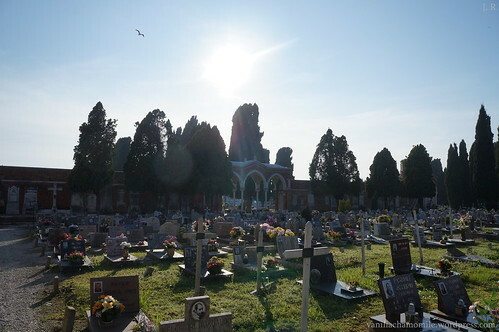 For the reasons you describe in your post (architectural, let’s say), I like cemeteries, plus there’s often this hush around that’s hard to find elsewhere in the city. And there’s the humbling feeling you get from being close to the resting place of so many people, some gone for over a century. In a way, when you’ve seen one cemetery, you’ve seen them all (simplifying things, but still), yet whenever I can, I like to see one I haven’t been to. It’s good to know I’m not that alone in that.